In this series, resident expert Dave Flynn discusses the four fundamental moves that can make or break your race. To start, Dave gives pro tips for the perfect tack and what you need to get your timing down. The key to a great tack is the rate of turn and timing between the release the trim. Get this down and you can avoid having to skirt all of the time. With the season just beginning for many sailors, I thought it might be a good time to get back to the basics. 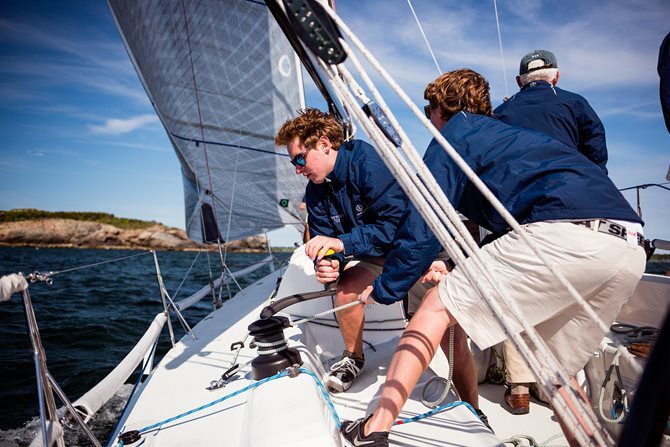 In sailboat racing there are four fundamentals you must master: tacking, jibing, spinnaker sets, and spinnaker douses. Until you have these down cold, you can’t really begin to focus on developing front row boat speed (and actual racing tactics and strategy will remain a strictly theoretical concept). Each of those elements needs to be understood to experience the perfect tack. Steering is the first element, and it can be broken into three categories: preparation, rate of turn, and build angle. First, everyone has to be ready. If the helms person simply turns when he feels like it without communicating clearly, the rest of the crew won’t have a chance to get the timing right and execute properly. Ready about especially should demand a response from the one person who is critical to its success: the jib trimmer doing the release. If he isn’t ready, you can’t turn. A simple countdown – “3,2,1, turning the boat” – also helps with coordination. The next key is rate of turn. For starters, the expression “hard a lee” should be banned. The last thing you want to do is turn hard. A slow, smooth turn is the goal. Keep one thing in mind as you enter the middle of the turn: where are you going? Ultimately, you’re trying to go straight upwind. You’ll need to vary your rate of turn depending on breeze velocity and sea state. In light air, you’ll have to turn faster. In breezy, bumpy conditions, a faster rate of turn is required, as you’ll have to consider stopping the boat. A rough guideline is that you want to come out of the turn at about two-thirds of your upwind target speed going into the tack. Going upwind at six knots, you probably don’t want to drop below four coming out. The final key to steering through the tack is to come out at the perfect build angle. Turn too fast and you’ll overshoot, coming out more on a reach. The boat will generate too much heel if there is more than 8-10 knots, and your trimmers will struggle to get the headsail in. Under-bake the turn and you’ll be too thin and unable to build speed. The sweet spot is full upwind on the new tack, just a hair below final upwind so you can accelerate. Heel is a great guideline. Start slowing the turn just before you get to optimum heel angle so the boat straightens out just as you hit it. Go too far, too much heel. Not far enough, boat will be too flat. In light air, you’ll need crew weight to generate the right amount of heel (more on that later). Executing a smooth, controlled turn that ends at just the right build angle is further complicated by the fact that there are usually bodies everywhere, blocking your line-of-sight and generally being disruptive. You need to stand up to see, so practice your footwork. Over time, you’ll use the same steps to cross the boat: stand up, face forward, and keep an eye on the bow and the horizon. The wheel or tiller will not tell you how far to turn. Reference the horizon and your angle to the waves. The second key to a great tack is the release. I know a lot of effort goes into pulling in the headsail on the new side, but it really is all about the release. As the sail luffs fifty percent of the way aft, spin all the wraps off the winch and make sure it runs. On a boat with overlapping headsails, this is harder. Don’t let the sail back against the spreader. Follow your release, pulling several handfuls of sheet from out in front of the block. On the new side, take your time. If you’re using non-overlapping headsails, your job will be much easier. The moment the release is made, pull like mad. For those with a genoa, just take slack out until the clew is past the leeward shrouds. Then pull like crazy. In light air, don’t over trim. Start with the sail eased from normal upwind to help with acceleration, gradually trimming in as the boat gets going. In medium conditions, you can trim in faster and hit the rail. In heavy air, you may need to take your time. Heel will be your guide. If you trim and the boat gets knocked down, you’re trimming too fast. The mainsail trimmer helps with the turn, and is the key to acceleration. Into the turn, trim harder to encourage the boat to come up into the wind. As the bow passes head to wind, begin to ease out on the new tack to help build speed. How far you ease is a function of wind velocity and position of the boat relative to the build angle. In light air, you’ll have to ease considerably (to get the top telltale flying). At the same time, pull the traveler up to get the boom up to the centerline to create heel and give the driver something to lean against. In medium air, the ease will be smaller, and the traveler will be moving through a much smaller range. In heavy air, you are controlling the heel. Ease whatever is necessary to keep the boat on its feet. I usually just nail the traveler down to pre-set positions for breeze on. Trim back in as the boat gets up to speed. Last, but not least, the final key to great tack is weight placement and movement. If you are hiking, the name of the game is staying on the rail as long as possible, then – in one cat-like move – scramble quickly to the opposite rail, hitting it just as the boat starts to heel on the new tack. Hiking like crazy helps with acceleration. In light to medium air, crew weight is part of the turning impetus. Slide in to create heel to help with the turn. Then hike on the new leeward side to create heel out of the tack. In the lightest conditions, you just stay to leeward, gradually moving a body or two up as necessary to maintain consistent heel. If it is slightly windier, stay to leeward for a few seconds to create heel, then move all the weight at once up to weather to flatten (the “roll tack”). Always keep in mind that movement kills, especially in light air, so get to the right place and freeze. There are a lot of moving parts and variables when it comes to a good tack, but it’s worth the effort to get it right. A good tack is probably somewhere between a half- to a full-boat length, at a minimum. How many times do you tack in a race – six, seven, eight times? Learning to tack well could save you several boat lengths. All it takes is practice.